Don't throw out that brown banana; it could be your next handbag. A Rotterdam-based collective of student designers is designing eco-friendly handbags out of leftover fruit waste. The students devised the project, Fruitleather Rotterdam, at the Willem de Kooning Academie of Art. At the crossroads of social consciousness, environmental awareness and fashion, Fruitleather Rotterdam presents a new way to consider food waste. About 3,500 kilograms, or about 7,700 pounds, of food per day gets tossed out at fruit markets. Not only is this wasteful, but it costs the owners of the fruit stands 12 cents per kilo to dispose of the fruit. That doesn’t sound like much, but, collectively, local farmers lose about $42,000 every day. Instead, to avoid these costs, many farmers dispose of their waste illegally. While Fruitleather Rotterdam is keeping some of their processes a secret, they did divulge some of their technique, including boiling the fruit to remove any bacteria and prevent rotting. Inspired by chefs' gastronomical technique of converting fruit into edible fruit leather as a garnish, they mash up the fruit, dry it out and roll it into their leather. Fruitleather Rotterdam doesn't just want to be a group of students working on a small scale; they hope to expand, working with businesses and organizations to continue to create stronger fruit leathers. 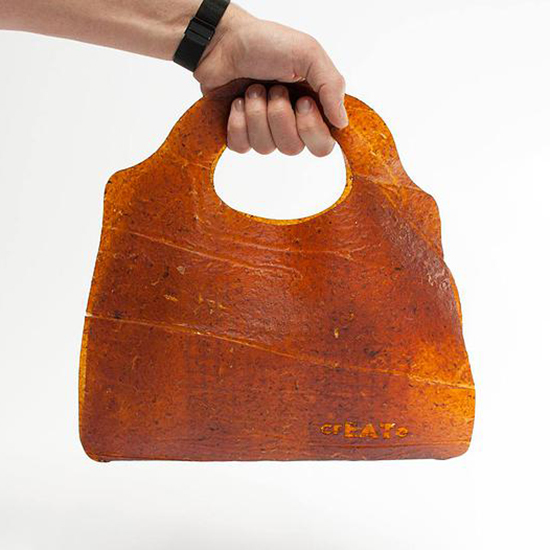 According to the group, the handbag is a sort of prototype: "The bag shows the quality and possibilities that fruitleather has to offer as a material." Eventually they hope to see a whole range of products made out of their fruit leather. For more, follow Fruitleather Rotterdam on Facebook.